Reduce orange juice by half by boiling in a sauce pan over medium heat. Combine all ingredients (but not the salmon) in a mixing bowl and whisk (or if you’d like, put in a blender). This is your marinade. Put salmon in a ziplock bag with the marinade and refrigerate for 4-6 hours. To Bake: preheat oven to 350 degrees. Remove salmon from bag and place on an aluminum foil covered baking sheet. 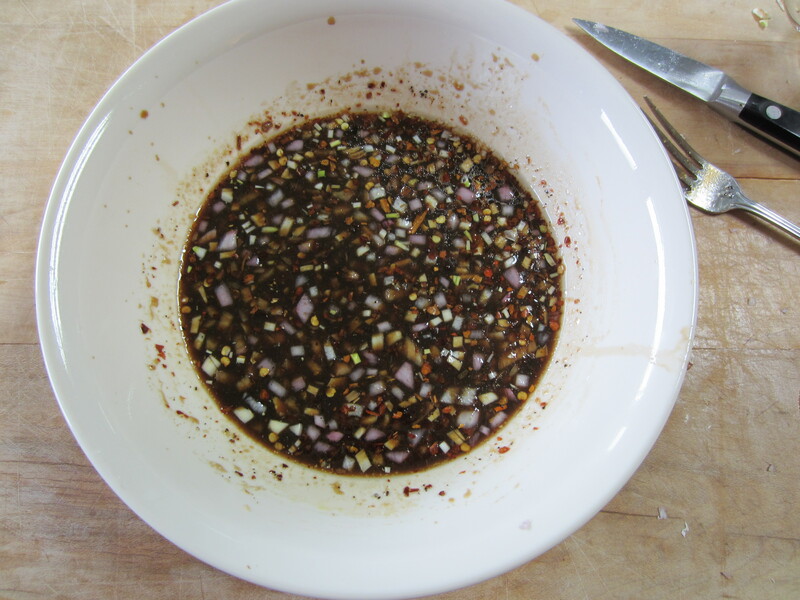 Brush with excess marinade and then discard whatever marinade is left. Bake salmon for 10 minutes or until salmon flakes easily with a fork. To Grill: preheat grill to 350 degrees. Remove salmon from bag and place on grill. Brush with some of the excess marinade. Grill for 5 minutes. Carefully flip the salmon. Brush with excess marinade and then discard whatever marinade is left. Grill for another 5 minutes or until salmon flakes easily with a fork. Preheat the oven to 400 degrees. Spread aluminum foil over a cookie sheet. Place sweet potatoes on the cookie sheet and stab with a fork four times along the top to allow steam to escape. Put in the oven and bake for 1 hour or until a fork stabs through with no resistance. Cut lengthwise and sprinkle 1 ½ tsp of brown sugar blend inside. Serve warm. Melt butter in a large skillet over medium heat. Add frozen green beans and cook to desired doneness, about 20 minutes, stirring occasionally. To speed up the process, cover the pan. Sprinkle with McCormick’s Perfect Pinch Roasted Garlic and Bell Pepper Seasoning to taste and serve. Jenny Craig: Really, it’s more like 2 ½ Starch, 1 Limited Free, which is great for dinner…though maybe half a starch too much. Maybe grab for a bit smaller sweet potato if this concerns you. Jenny Craig: 3 Meat, 3 Starch, 1 Fat, 1 Vegetable, 1 Limited Free, Lots of Free Foods (especially if you opt for more green beans). See Note About Starch below. Whew, that was a lot to type out. It felt a whole lot easier to just make it. Trust me when I say that the green beans and the sweet potatoes were a lot simpler than they seem after all the steps are written out. Just bake the sweet potatoes and stir around the green beans in a frying pan. My mom, Diane, came up with this salmon recipe. Last time I visited my parents’ house up in the Chicago suburbs, she had leftovers in a zip lock and I couldn’t stop picking at it, cold! I thought I’d give it a shot. Whenever I make a big meal that’s not a one pot deal, I usually spend a lot of time on either the entrée or a side, and make the other parts of the meal simple. So here, I focused on the salmon. 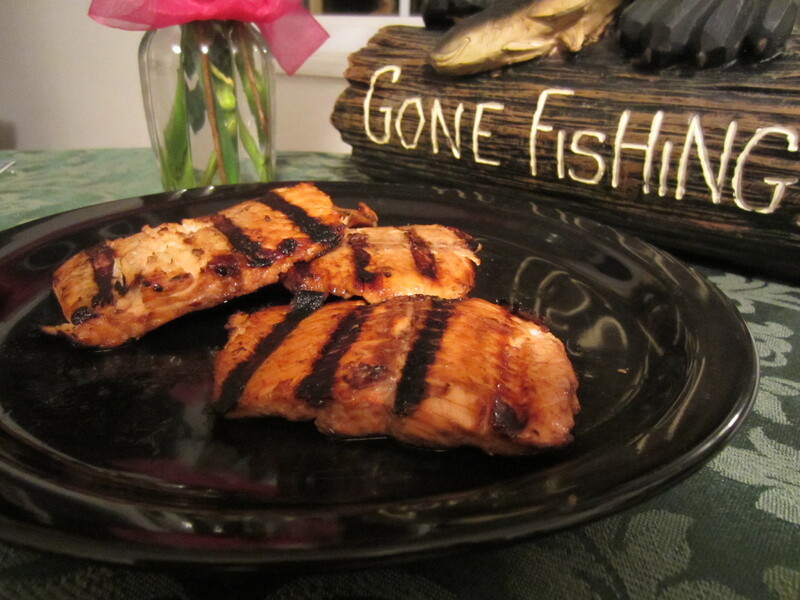 In the salmon recipe, I included two different cooking methods: baking and grilling. When I made this as a meal for my in-laws, I baked the fish and used frozen salmon, since fresh salmon and a grill weren’t available to me. Later, I tried grilling the fish. The crispy grill taste, along with the more attractive look, improved the dish, but not enough to negate baking as an option. 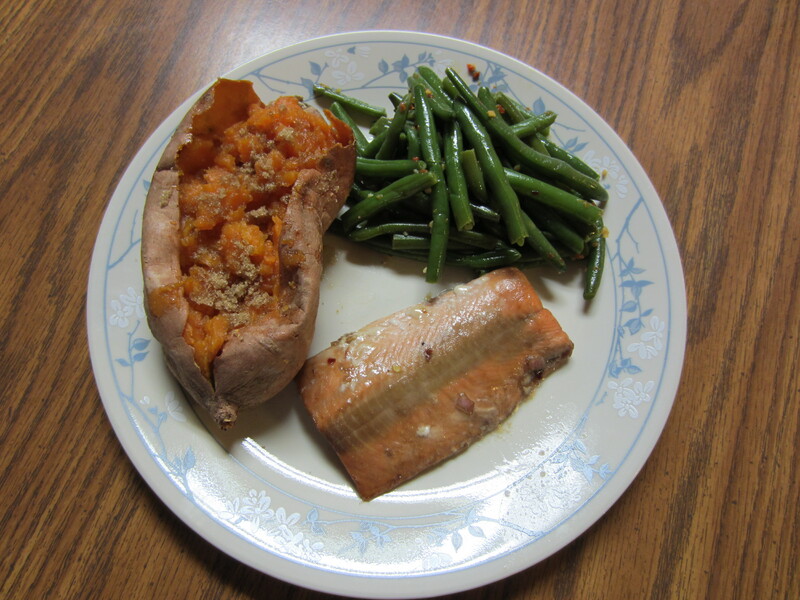 Also—and this is really simple to do—when I baked the salmon, I overcooked it. At 10 minutes in the oven, I checked the salmon with a fork. It was perfect for me, but my in-laws aren’t the kind of people that like anything medium or rare. They like their cows/fish/chickens dead. I like my cows mooing, my fish swimming, and my chickens still squawking…all on my plate (though, maybe not the chickens, ‘cause that’s unhealthy, but I definitely want them still juicy…dried out birds are no good). So I left the salmon in the oven for a total of 12 minutes. If you like your fish well done, go with 12 minutes. Personally, I felt I overcooked it. So I recommend 10 minutes in the oven. 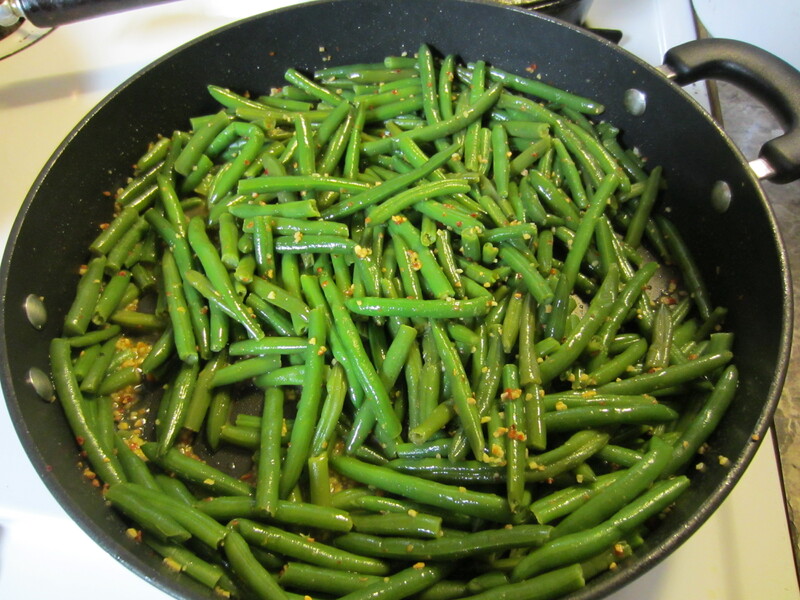 The real trick to the green beans is in the seasoning. My father in law isn’t one for vegetables, but when he tried these, he said, “Whoa, that’s got some zing!” I’m pretty sure that was praise. Keep this seasoning in mind for any vegetables you want to cook fast but without added calories. I recommend it to everyone! Seriously—grab a frozen steamer bag of pretty much any vegetable or combination of vegetables that’s sauce free, throw it in the microwave, add this seasoning, and done! However, if you’re trying to watch your sodium, going easy on the McCormick’s Perfect Pinch Roasted Garlic and Bell Pepper Seasoning will help. It’s got 75mg sodium per ¼ tsp. Personally, however, I love it, so I dumped it on. Another way to cut down on sodium is to skip the salt in the marinade for the salmon. I don’t really think it’s necessary with all the other flavors and spices in there. That would reduce the sodium by 73mg per serving. Note About Starch: As far as dieting, I understand this meal is a bit high in calories/carbs, especially for you Jenny Craig’ers. If that’s the case for you, get a smaller sweet potato. Even if everyone else you’re eating with wants a ½ lb potato, you can choose a smaller one for yourself and cook it along with theirs. A 1/3 lb potato can reduce your carbohydrates by 15.5g (that’s 1 Starch serving) and 66 calories…and that’s with the Splenda brown sugar blend. Honestly, an hour a potato is pretty safe, no matter what the size. Sometimes, if it’s a giant sweet potato, it may take an extra ten minutes, so you do want to check it with a fork and make sure it’s mushy. But it honestly takes a lot to burn one, so don’t sweat it if yours is smaller. One pot meals are so much easier to blog…especially with Ginny. And make, for that matter. But you know, every once and a while, it’s nice to make a special, pretty meal. Plus this was actually a deal I worked out with my mother-in-law. I cooked for her and the family—she sewed together a pair of reenacting breeches for Thomas. I think the exchange worked out well for both of us (especially because, much to her surprise, I’m pretty sure she actually liked the salmon).